What beer should I drink? Thread: What beer should I drink? There are so many of them in Thailand these days, I do not know which one to choose anymore. Why do they make our life so difficult...? I'm just about to go buy my nightly four cans of Chang. I choose it because it has the best buzz to the baht ratio of any locally brewed beer. I'm not a connoisseur, I'm just an alcoholic. I drank all the Cheers I could once for 80B lasted 4 hours then my mate and i had to go . Wicked hangover. That's just the evening, remember. There's a whole day preceding that. I do five of Chang but buy the big bottles at the military shop for 30 or 29 a bottle. I did stock up though as they close 13-16 this month. Dont worry a bottle of chang stays carbonated. Dont ask why!! Actually the Chang makes me sick, I never drink it. The Cheers I do not really know. The Leo makes me even sicker. So the only one I drunk among the local ones is the Singha. Singha I like with food. It's a bit sweet so it goes well with Thai food. And, what did he tell you? Used to love Singh even imported it into the US it had to be hand labeled stout as the alcohol content was too high for "beer" in California. Had cases in my kitchen. But alas I grew tired of it. So it was Chang, dont ask me why, but friends from abroad all seem to like it!! So what the hell!! I do not think they put it in the Singha, only in the Chang, Leo and Cheers. I don't think they put it in any of them. Old urban legend, long since busted. I think you get a headache when you drink too much of any beer. Wait. I'll let you know tomorrow. My personal preference is 'Red Horse', a Philippine brand brewed under licence in Los. Can't get it in my Moo-ban, though. It is the only beer here that I can drink. I think it is one of the strongest beers available in LOS and the price is good at 395 per case. Don't know if this is still available but the last case I bought in Makro, they gave me 100 baht worth of free Pepsi with it. I've never tried it; I guess I should. It's not available in the Moo Baan here, but I've seen it at the larger outlets. I'm off to Da Mor tomorrow, so maybe I'll get some. It has sentimental value for me, but it's a good brew, too. If you want to experiance projectile vomiting then I would reccommend "Thai Beer", I had one bottle of it and nearly finished it, it was quite amazing how far you can vomit, reminded me of that film poltergist. anyway chang is ok and tiger and heiniken, aint tried the san miguel here yet. I am a bit of a whimp when it comes to sharing details of my life before I became a respected member of the community. Living in Phrae, you'll understand. Last edited by stroller; 13-04-2006 at 10:56 PM. I had kind of an interesting drinking day yesterday. 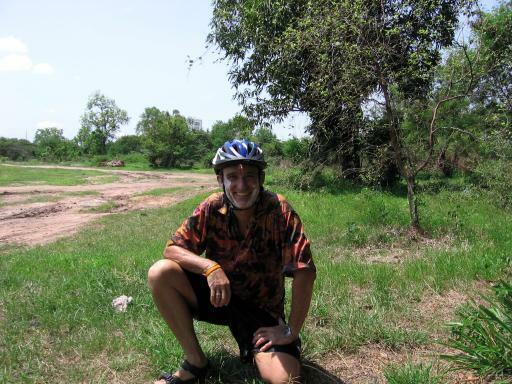 I was on my bike observing the Songkran madness. On the way back I rode right up to the back of a pickup truck. One of the passengers handed me a beer in a plastic cup. I drank that and then every time I saw guys drinking I asked for a refill. Everyone was quite generous and I was nearly drunk by the time I got home. Of course, it turned out to be a mix of beeer, Spey Royal, 100 Pipers and Lao Cao.